At least once a week we receive a request from a collector who is trying to identify a sheet of unsigned flash. They may have bought it on eBay or just rediscovered it in the back of their shop. It is sad but true; most antique tattoo flash is unsigned. In days gone by, the tattooist probably looked at the sheets of flash they produced as just working tools and not as pieces of art. Do you think they ever thought that collectors would be bidding for these sheets or that they would to become one of the most desirable of all the tattoo memorabilia? Now and then there will be a "tell" about who may have drawn that unsigned sheet; initials in a banner, a certain way of shading a leaf, the way a woman's face is drawn. But these "tells" are not always right, they are just educated guesses. For serious collectors, educated guesses are just not good enough so there must be other ways to help identify these sheets. Following is one method that I have found that helps with this identification. If you have a sheet of flash that is unsigned but you believe that it was done by Doc Webb for example, start looking for photographs of the inside of Doc Webb's shop. Maybe you can find one that includes his wall of flash. Enlarge your photograph or use a magnifying glass to see if your sheet is there. Often you will be rewarded for you diligence. Look at the images included with this article. The black and white photograph shows Sailor Jerry on the left with Johnny Walker. 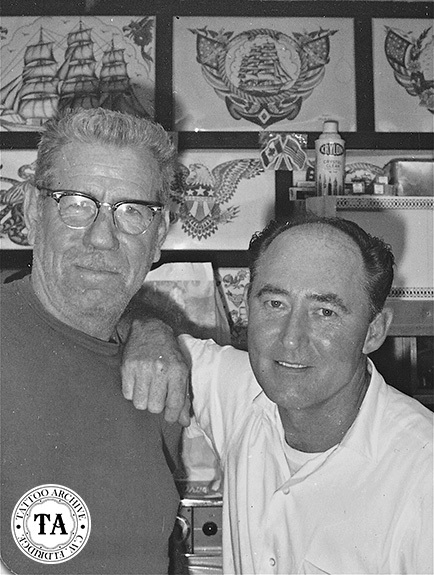 This photograph was taken in 1966 while Walker was working with Sailor Jerry in Honolulu. 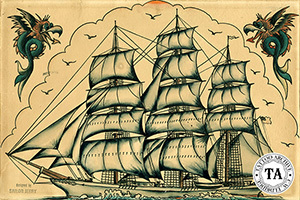 The other image is a sheet of flash by Sailor Jerry of a sailing ship. If you look closely at the black and white photograph you can see the same sailing ship sheet of flash sheet behind Sailor Jerry. Although most of Sailor Jerry's flash is relatively easy to identify since it is signed or at least rubber-stamped, we hope this will help you in identifying some unsigned sheets in your collection. Unsigned sheets of flash are an invitation for unscrupulous people to forge signatures as a way to add value to their flash. Perhaps in the future tattooist's signatures will become another important tattoo collectable.